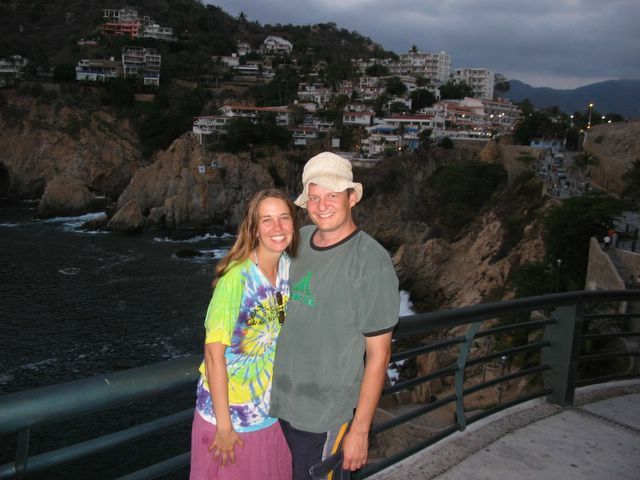 While relatively small and laid back, Zihuatanejo is definitely on the tourist map, and we encountered a significantly higher proportion of gringo tourists here than in anywhere else in Mexico that we’d been so far. However, the typical gringo tourist in Zihua seemed to be of the gray-haired, pony-tailed and bearded variety, and there weren’t a whole lot of younger folks around, nor up-scale golfing types, for that matter. Nevertheless, unlike everywhere else we’d been in Mexico, most of the people working in the restaurants and bars here speak some English (making things much easier for Rob, who is still in the early stages of learning Spanish), and, despite Carley’s near-fluency in Spanish, our waiters and waitresses usually wanted to show off their English-speaking skills for us. Zihua is such a laid back town, we ended up spending 2 nights here, even though we didn’t really do much of note. We could have gone diving, horseback riding, deep sea fishing, fine-dining on the cliffs, or any of a variety of tourist beach activities, but mostly Carley just got some work done and Rob did some reading. On Wednesday we hit the road again, heading on down the Costa Grande (big coast) of the state of Guerrero. The highway actually runs several miles inland, and we passed through what seemed like hundreds of small inland towns, each with its set of massive speed bumps and roadside vendors. Around mid-afternoon, we finally reached our destination for the night, the biggest and oldest city on Mexico’s Pacific coast, the grand-daddy of Mexican resorts, Acapulco. Acapulco has been immortalized in countless Hollywood movies (including the Elvis Presley classic “Fun in Acapulco”), and it’s usually remembered for its miles of beachside hotel towers situated on a beautiful bay. 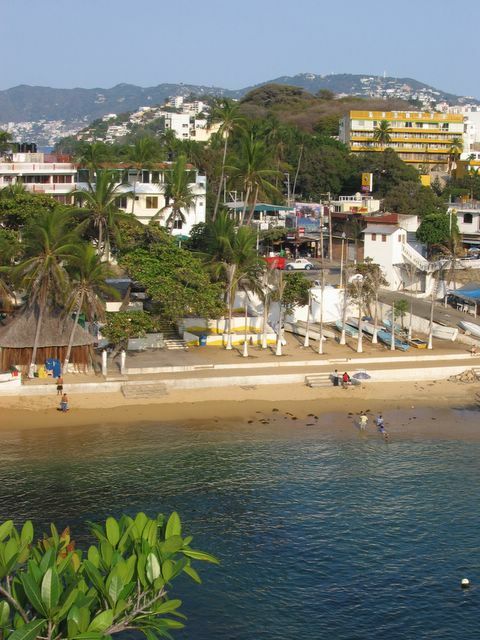 However, we rolled into the northwest side of Acapulco, the “old city”, a much seedier section of town crammed with traditional markets, piles of traffic, and a strip of old budget hotels. This was the area we were looking for (remember our budget?) and we settled into a cheap room at Hotel Coral, complete with a balcony over-looking the neighbors’ rooftop laundry. The nice thing about the “old city” of Acapulco (besides the lack of overly-touristy tourists) is that it has its own little beach (Playa Angosta, mostly deserted) and a beautiful cliff-side walkway overlooking the ocean and La Quebrada, where you can watch the famous clavadistas (cliff-divers) perform their daily mind-blowing swan dives off of a 100-foot cliff. 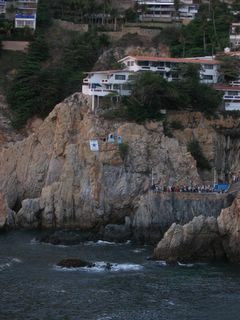 We could have paid a few bucks to watch the divers up close, but we chose to watch for free from a more distant walkway, where we befriended some Mexican students from Guanajuato, who hooked us up with some of their cold cerveza. We then sat at an outdoor table on the zócalo (town square or plaza) and enjoyed a delicious pizza (Acapulco has quite a variety of gringo-friendly restaurants) before hitting the sack early. Thursday morning we hit the road early, eager to get out of Acapulco. We had a 6-hour drive ahead of us to reach our next destination, the legendary beachside village of Puerto Escondido. On the way out of Acapulco, we drove through the “tourist zone”, complete with its miles and miles of extra-large hotels, KFCs, Burger Kings, Subways and Wal-Marts. Yikes, they’re everywhere! !